2. Bevel both pieces of all the hinge joints. Lay the stabilizer top side down (important for painted kits) with the hinge edge slightly back from the edge of the work surface or table. 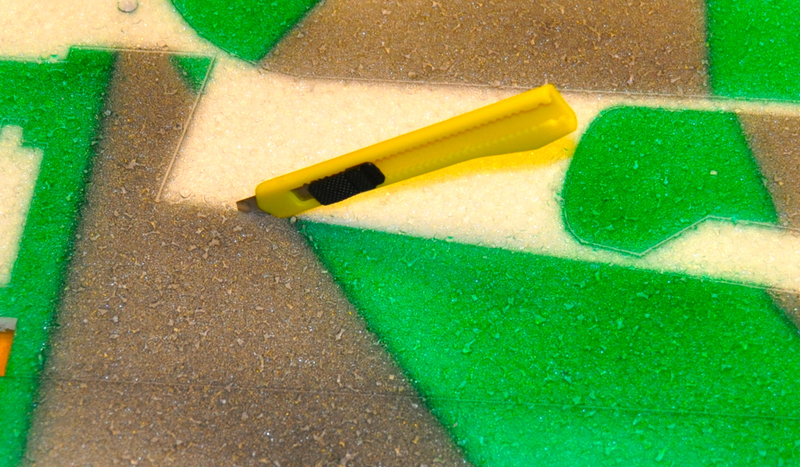 You want to cut the foam to a point but not remove any of the top paint surface. 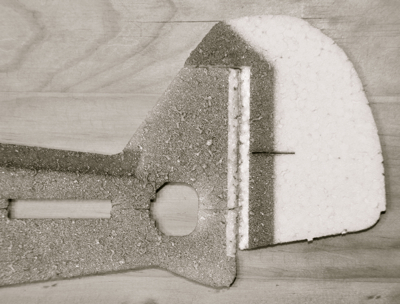 Place a cork backed metal ruler on top of the stabilizer the same distance from the edge as the thickness of the foam. Using a new X-Acto blade or snap knife, trim along the edge/ruler at a 45 degree angle the length of the edge. If the foam starts to drag and rip, change to a new blade. Cut the elevator in the same manner. Cut bevels in the elevator counterbalances to prevent binding. 3. Continue cutting bevels in the aileron and wing control surfaces being careful to make left and right ailerons and the matching surface on the wings. Again, lay the top painted surface on the table through this process. Do not cut the bevels in the fuselage or rudder at this time. 7. Insert the carbon fiber strip into the wing slot and while lightly compressing the foam around the carbon fiber strip, wick CA into the joint and use kicker to make it seal. Work your way down the joint being careful to keep the wing flat on the building surface (this is why you protected it with plastic/wax paper). Once you have applied glue to one side, flip the wing over and apply glue to the other side also to firmly attach the wing support. 8. 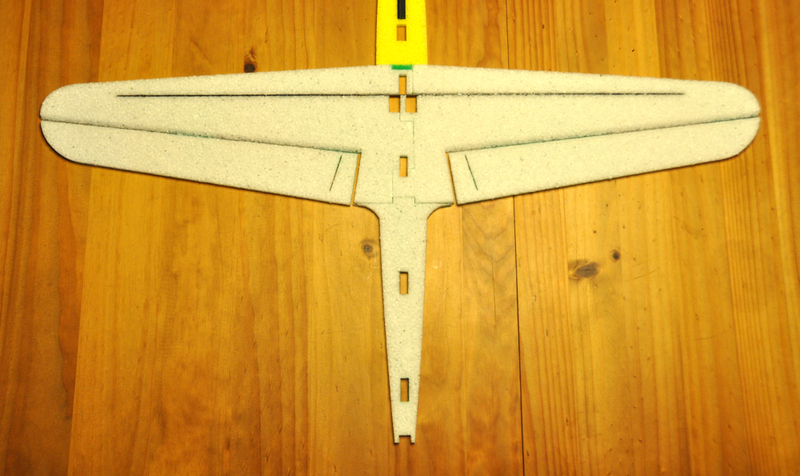 Locate the horizontal front (motor mount area) of the fuselage and fit it to the front of the wing. 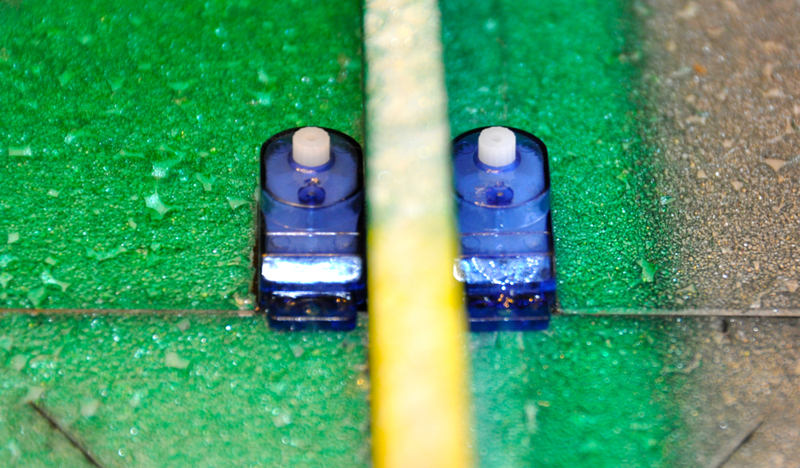 Spread contact glue on both edges that come in contact and press in place. 9. 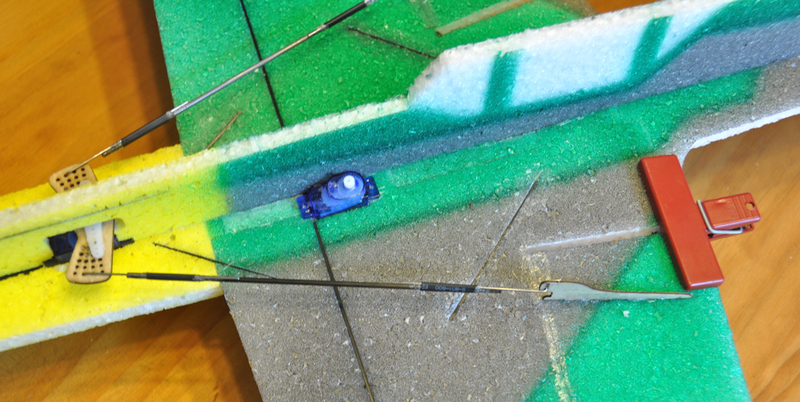 Find the pieces for the motor stick mount and glue it into the forward slot in the horizontal front Fuselage piece. 10. Attach the rear horizontal fuselage piece to the rear of the wing in the same manner. 11. Take the stab/elevator assembly and making note of the wing hinge line (we consider the side with the smooth joint the top and the side with the bevel to be the bottom), attach it to the rear fuselage piece in the same way with the hinge facing the same side as the wing (both up or both down). 12. 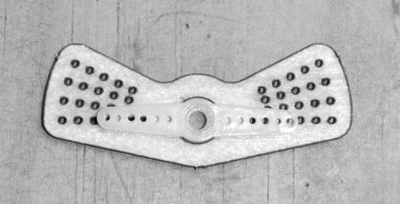 There is a small piece of flat carbon strip in the kit which can be optionally used to further reinforce the nose of the plane. Just cut the carbon in half and cut slices into the nose area as shown and CA in place. 13. Install another piece of carbon across the aileron corner to prevent ripping in this location. 14. 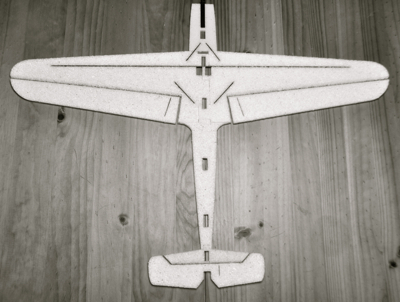 You should now have an outline of the completed plane. 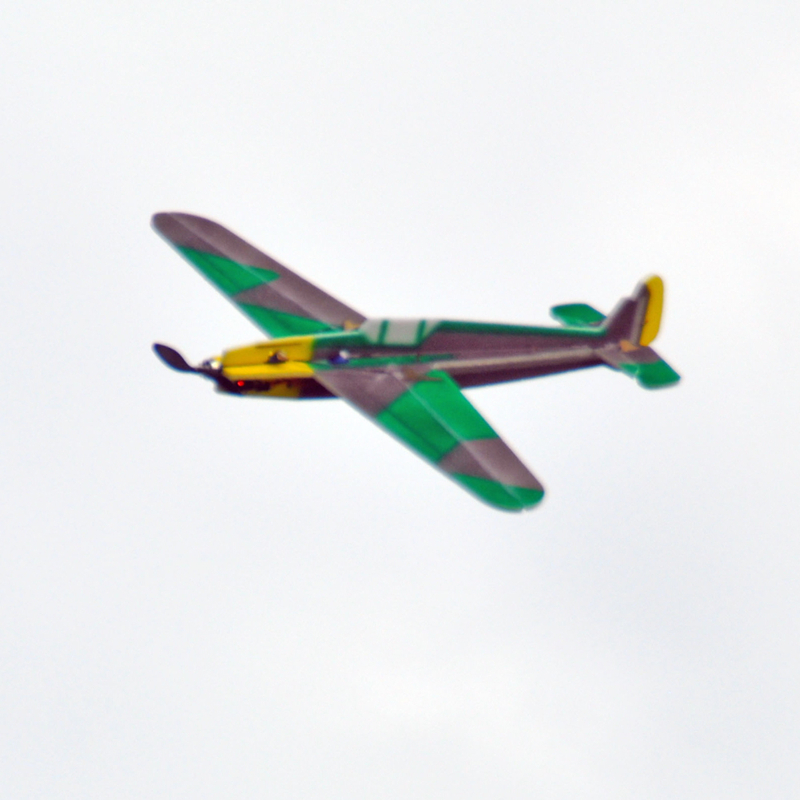 This is a good place to paint the plane before you attach the fuselage pieces if you purchased an unpainted kit. 15. Once your paint is dry, remove the fuselage halves from the foam sheet and bevel the rudder hinge joint. Check the elevator horn slot position. You want the point of the rudder hinge bevel on the side opposite the elevator horn slot. This allows your rudder horn and servo to be on the side opposite the elevator servo. Make sure that you bevel the same sides of the rear fuselage and rudder. Do not hinge the rudder at this time. 16. Place the plane outline subassembly with the smooth hinge joint/top paint surface down on the building surface so the V bevel is facing up. 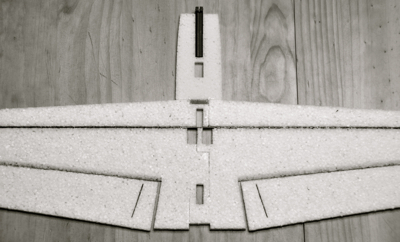 Find the fuselage bottom and test fit it into the notches on the outline. Smear glue on the two pieces and attach the fuselage bottom in place making sure it stands perpendicular to the horizontal surface. 17. 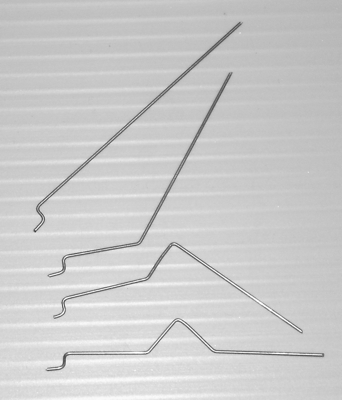 Find the two thin (3mm) wedge shaped EPP tail stiffeners. 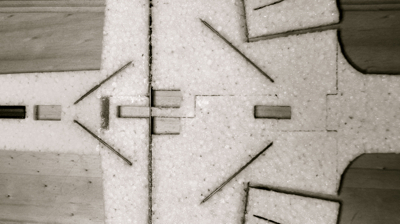 These are glued to the bottom of the fuselage at a 45 degree angle to form a triangle cross-section with the fuselage bottom and horizontal outline that is even with the rear fuselage bevel. This will prevent the tail from twisting in flight, so it is important to complete this step flat on the building board to maintain the alignment. 18. The large end of the wedge should face the front/wing end. Dry fit the wedge in place so you have an idea of where the glue should be spread and attach one of the thin wedge shaped pieces to each side of the rear fuselage. This is a good place to take a break and let all the glue strengthen. 19. Take the plywood aileron servo bellcrank (bowtie shaped) and glue it to the existing nylon servo arm using CA. Rough the surface of the nylon servo arm with sandpaper first. Position/align the center hole of the plywood bellcrank concentric with the screw hole in the nylon servo arm. If you are using the 9 gram HXT900 servo included in our completer kit you will find alignment holes in the bellcrank that either the .032� z-bend rods or #1 screws can be used to align the bellcrank. We have cut the center hole to be snug on the servo arm and attach under the arm. 20. With the aileron servo bellcrank mounted as shown, install the 9 gram aileron servo in the precut hole in the front of the plane. Note that the servo output shaft is towards the rear and the flat side of the bellcrank is also. Tack glue the servo in place with your preferred method, I use Foam-Tac glue on the mounting ears but other people use low temperature hot glue. 21. 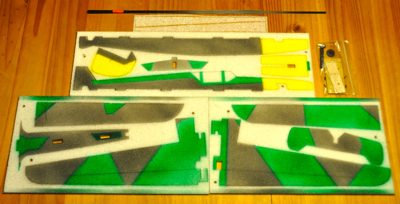 Using a small piece of the flat carbon fiber, cut a slit in and reinforce the area over the top of the aileron servo cutout in the top fuselage. 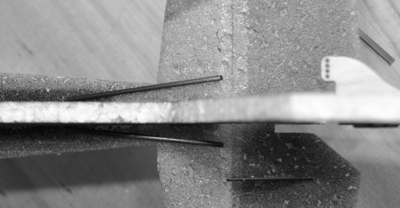 Extend the piece beyond the cutout to reinforce it in the case of hard nose in landings. 22. Glue the fuselage top onto the plane, aligning it with the slots. Cut the servo hole out if necessary to allow clearance over the servo arm. Glue with contact glue. 23. 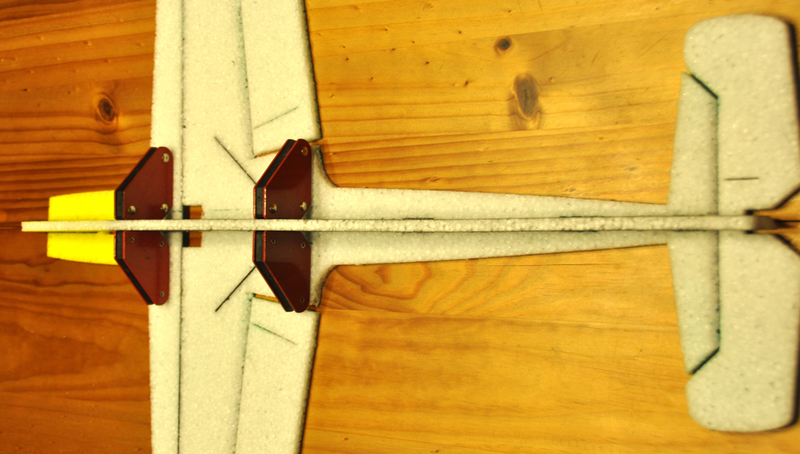 Insert the aileron control horns into the precut slots in the top of the ailerons so they are flush with the bottom of the aileron slot and the holes are aligned over the hinge line. Glue in place with CA along the entire length. These longer horns provide support to the control surfaces. 24. 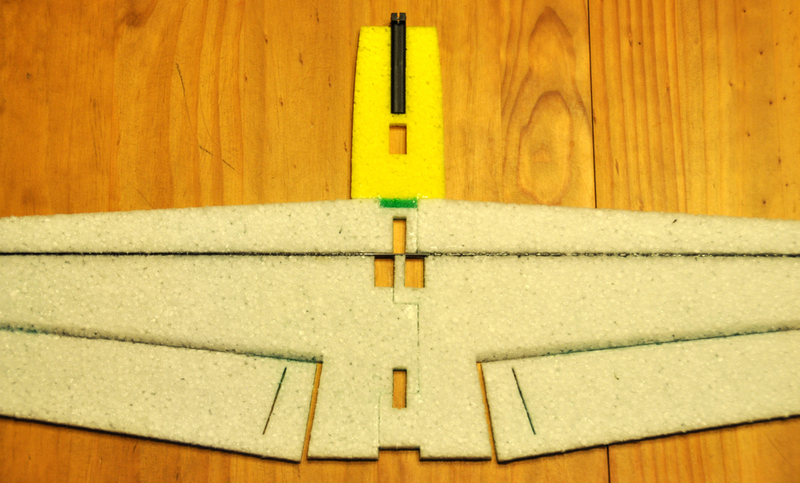 Put the elevator and rudder 5 gram servos in the precut servo holes just behind the wing spar. 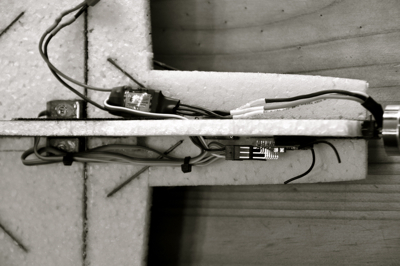 Glue the servos in place. CA can be used, some people prefer hot glue or you can use contact glue. You want them firmly attached. 25. 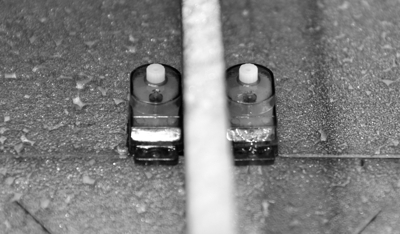 There are two ways to make the control linkages adjustable. With the materials provided you can bend a V into the z-bend rods which can be pinched or spread to adjust the control centering. This is generally good enough since the alignment is only necessary when you set the plane up initially. The second method that can be used is to buy optional mini (to fit .032� wire) EZ-Connectors and cut the z-bends off the end of the pushrod wires. Either of these methods work and only need to be done at the servo end of the pushrod. If you choose to make these V bends, make 4 to have one for each pushrod. 26. Find the aileron pushrod materials. You will need 4 pieces of shrink tubing, 2 straight Z-bend, 2 Z-bend wires with the adjustment bends from the previous step wires and the two short pieces of carbon rods. 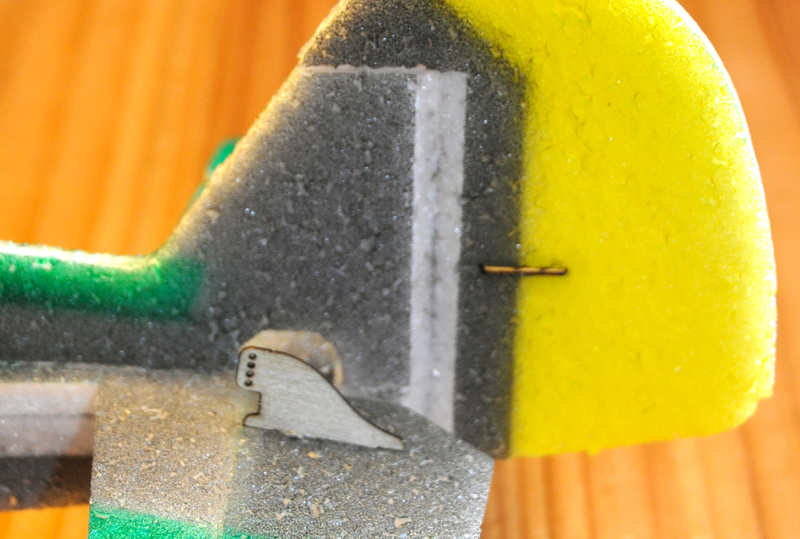 Use a piece of sandpaper to gently rough up (remove the gloss) the ends of the carbon rods and the straight ends of the adjustable Z-bend wires from the step above. Use a piece of the heat shrink tubing (doesn�t need to be shrunk) to hold the wire to the rod and attach it with Foam-Tac or CA glue. 27. Place the Z-bend wire into the hole shown on the bellcrank. With the bellcrank straight and the aileron level, Mark and cut the carbon fiber rod so it is about 1/8� from the control horn. Save this piece of rod. Remove the pushrod and sand the end of it to remove the gloss. Also sand the straight end of one of the non-adjustable Z-bend wires. Put the pushrod back into the bellcrank and slide a piece of heat shrink over this end. 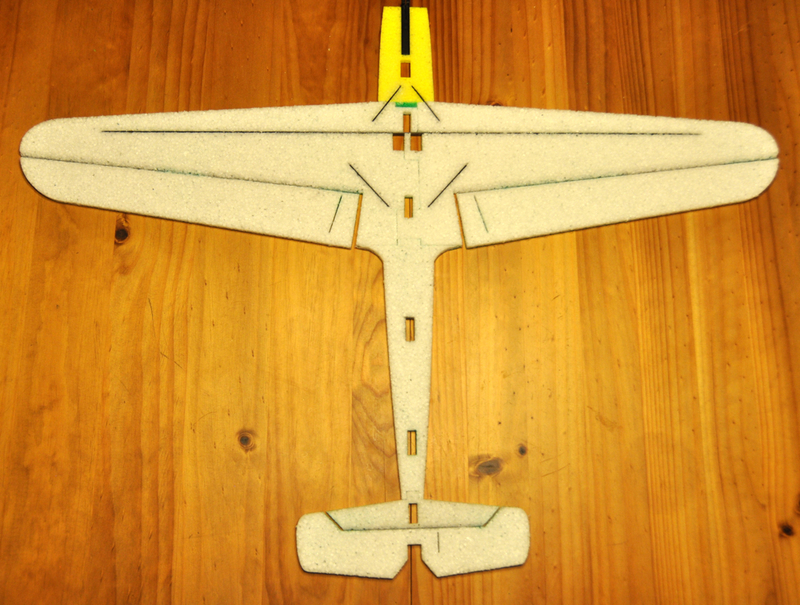 Using a pin or clamp or clothespin, center the aileron surface to the fuselage. Put the Z-bend wire into the 2nd hole of the aileron horn and slip the heat shrink tubing over it to hold it in place and carefully CA the wire to the carbon rod to secure it. Be careful not to get any glue onto the Z-Bend on the horn. Follow the same procedure on the opposite aileron linkage. Rotate the servo to see that the controls move freely. 28. 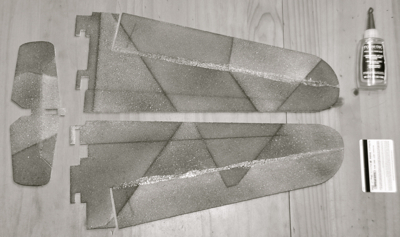 Hinge the rudder to the rear of the fuselage using a contact glue hinge as done on the other control surfaces. 29. 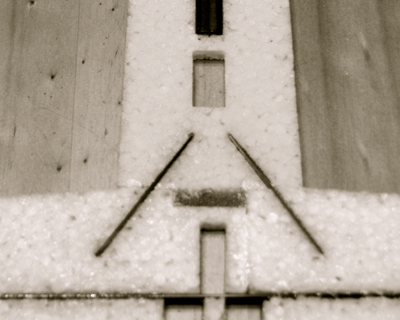 Locate the elevator horn and glue the horn in place using Foam-Tac or CA so the holes are aligned over the hinge. 31. 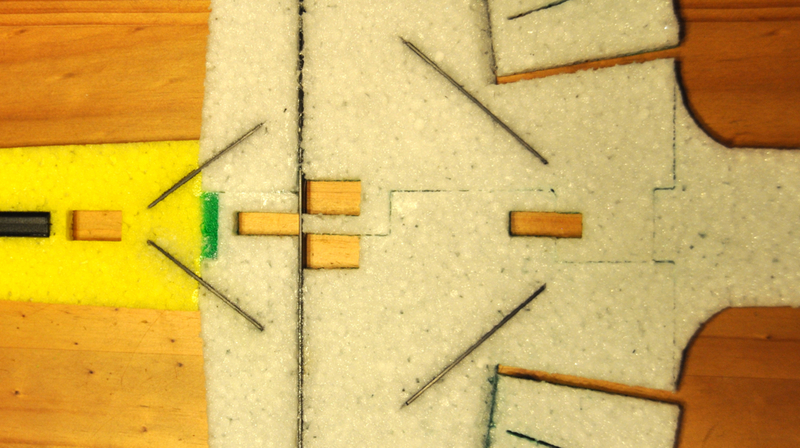 Using the remaining Z-Bend wires and heat shrink tubing create the rudder and elevator pushrods in the same manner as the aileron pushrods. Attach the adjustable Z-Bend wires to one end of the carbon rods and then with the servo arms perpendicular to the fuselage and the control surfaces aligned at neutral, cut the rods to length. Before attaching the horn Z-Bend wire, slide two of the pushrod standoffs onto each rod from the bellcrank plywood sheet. 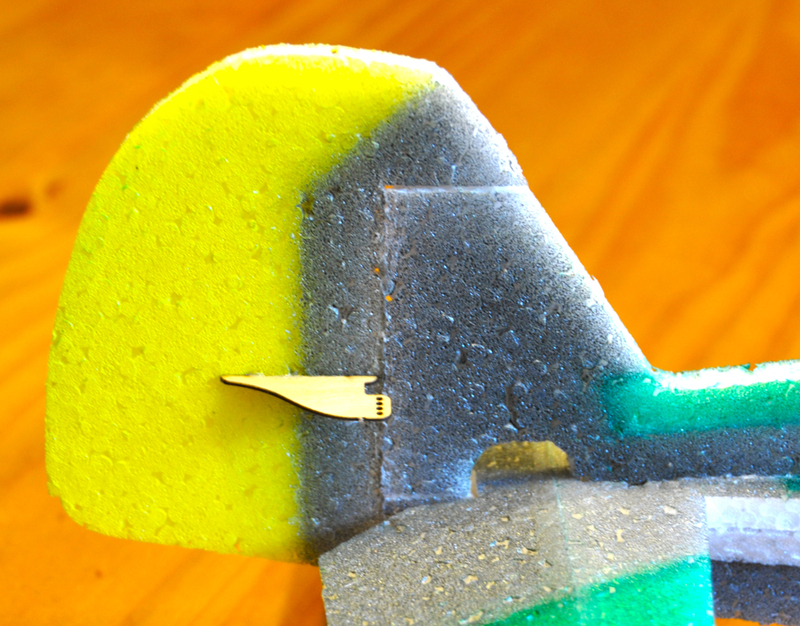 Put the Z-bend wires in the 2nd hole down on the horn and secure with the heat shrink and glue with Foam-Tac or CA. 32. 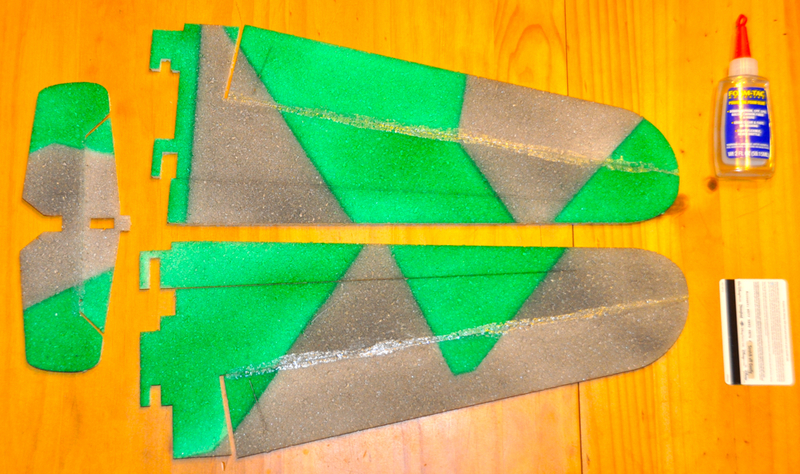 Using the short carbon fiber cutoff pieces from making the aileron pushrods, cut diagonal slots in the foam between the rear fuselage and front of the stabilizer long enough to insert these pieces and glue them in place using CA glue. This helps prevent the stabilizer from skewing with full elevator deflection. 33. 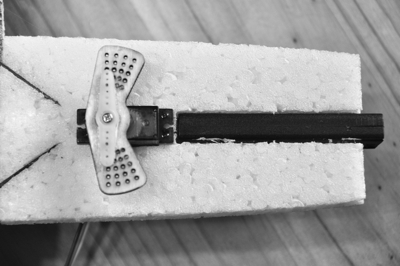 Poke the pushrod standoffs into the foam at 1/3rd intervals along the pushrod to keep it from flexing in flight and glue to the foam using CA, being careful not to let it run up the plywood and bond to the pushrod. 34. Install the motor and propeller and position the ESC on the front of the plane. Position the receiver also. 35. The plane is now completely assembled. 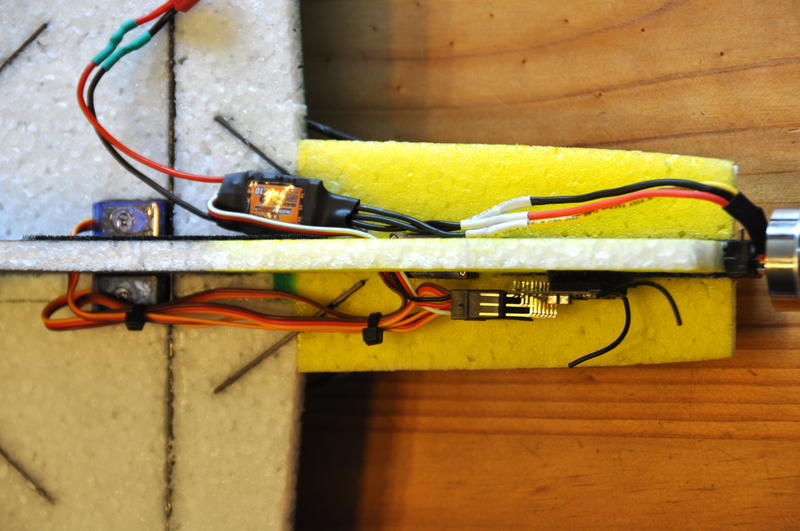 Route the servo wires through a slit in the foam to the receiver side of the fuselage and connect the servos to the receiver and using Velcro, attach the receiver and ESC to the fuselage. Use tie wraps to gather the wires in a neat bundle. 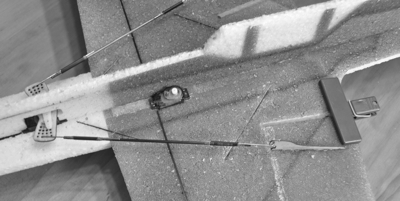 Put a long strip of Velcro on the opposite side below the wing spar in order be able to move the battery forward and back to fine tune your balance. The Velcro will stick best to the EPP if you rub some contact glue on the area you are attaching it to. 36. The CG of the plane is on the carbon wing spar to 1/4� behind it. 37. Control throws are a matter of personal preference. 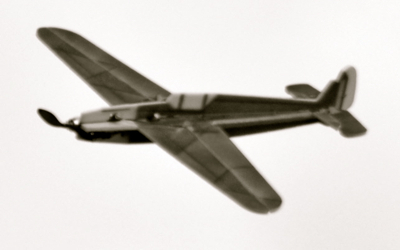 Some people want lots of surface movement to do 3D maneuvers while other people like a more docile handling plane. You can add exponential to your controls to calm down the center portion of the travel. 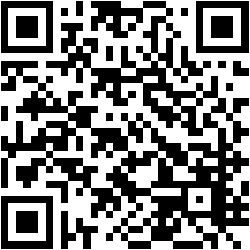 EPP is very durable and also easily repaired. Don�t be afraid to challenge yourself and learn new things. Get out and enjoy flying.